Leading Manufacturer and Exporter from Mumbai, our product range includes Neurology Medicines such as Lenalid Capsules and Chorionic Gonadotropin Injection. Uses:- HCG Injection is also used in young boys when their testicles have not dropped down into the scrotum normally. This can be caused by a pituitary gland disorder. 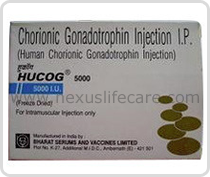 HCG (Human chorionic gonadotropin) is given as an injection under the skin or into a muscle. Side Effects:- Hand or leg swelling, stomach pain &swelling, breath problem, weight gain, nausea or vomiting.